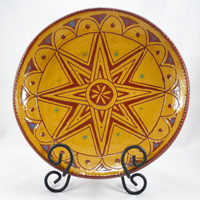 Back in October I was fortunate enough to attend a workshop conducted by Ned Foltz, an accomplished ceramicist who specializes in traditional Pennsylvania German Redware pottery. Check out his website Foltz Pottery. A former art teacher, Ned has been making traditional redware for around 50 years now, and it was a real treat to spend a day learning from him. The workshop focused on two decorative techniques that Ned routinely uses on his pots: slip trailing and sgraffito. The technique that really inspired me was the sgraffito.